There are quite a number of low cost Windows 8/8.1 out in the market. These range from 7 inchers to 8 inchers and in some rare cases 10 inchers. Microsoft doesn't charge those who are bundling Windows on devices below 9 inches so that has been an interesting proposition for most OEMs and other Microsoft partners. Like the first Windows 8.1 tablet from Lenovo we were drooling over some time back. What we have not seen however is an explosion of such budget Windows tablets in the African market or even their popularity surging. 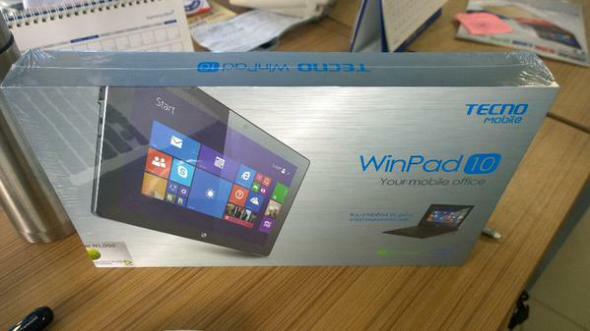 That could change when one of the biggest brands in mobile in Africa today, Tecno, unveils its new WinPad tablet running Windows 8.1. Tecno has turned heads in the African market where it operates at the moment. With a factory to churn out its devices in Ethiopia, the company is widely popular in the Kenyan and Nigerian markets. It is in the latter market where the WinPad 10 is launching in the next two days with Kenya and a few other African countries being the next likely destinations. We have few details about the tablet's specifications. We were after all tipped by someone in the know who wishes to lie low for now. Besides the obvious 10.1 inch (1280x 800 pixels) IPS display that gives it its name there will also be a 2 megapixel camera for Skyping, a 5 megapixel camera at the back, an Intel Atom Z3735F processor clocked at 1.8 GHz, 2 GB RAM, 32 GB internal storage (expandable up to 64 GB), a hefty 7,000 mAh battery, a 3-in1 keyboard (i.e stand, case and of course, keyboard) and dual "BOOM" speakers. Of course you've heard of the Boom thing elsewhere. 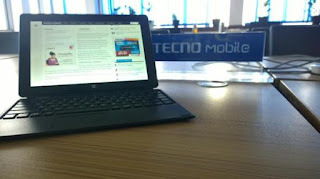 The Tecno WinPad 10 tablet will also come with built-in 3G connectivity and Bluetooth 4.0 for pairing with that keyboard. The price? It will go for 57,000 Naira (that's an equivalent of about Ksh 28,260 or $287). While it will initially ship with Windows 8.1, an update to Windows 10 will be available for free immediately it goes live at the end of July. Buyers of the Tecno WinPad 10 will also be getting one full year of Office 365 and of coure the 1 terabyte of OneDrive that comes with it for free. To top that will be the 60 minutes worth of free Skype talk-time anywhere in the world.